In 2014 Kenny inspired me to change all my cards with Citi and since then I do this with all my Citi cards that do not fit my needs/annual fees that do not justify keeping the card. Sure you can always try and call retention to waive the fee, but how many times can you use the same line? How often have we struck out with the annual fee waiver? I can count many times. I can see Citi tightening up in the near future given all that has happened recently. 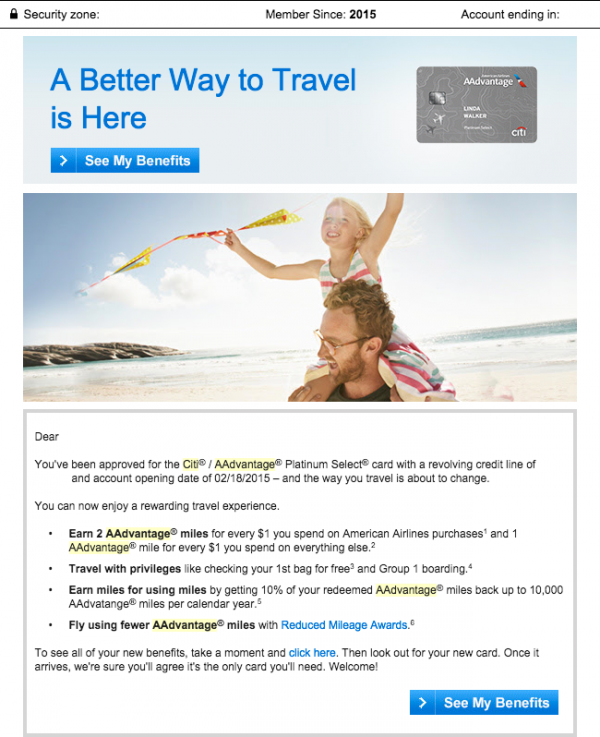 In February 2015, I applied for the Citi American Airlines AAdvantage card. As soon as the statement for March 2016 closed, I was able to product change this card. Before the March statement, during one of one my calls with Citi in early February, I inquired with the CSR if I can make a product change. They said that because the product was not even a year old I was ineligible for a product change. Once the February statement closed, I called Citi and was able to make the product change. It was the most interesting phone conversation with an agent I’ve had trying to product change based on her level of knowledge of current credit card offerings. All the other calls for a product change I always tell the agent, “I’d like to product change into the [product XYZ].” This time, I asked her to tell me what the current cards I can change into. The agent tried her darnedest for me to take the Citi Double Cash card. She kept telling me about how it’s got a great rewards program, can redeem for cash, and a few other things and I don’t recall. She was really good with sticking to her plan. She would not budge from her plan. I was not going anywhere with her so I just asked her for the Dividend card. She is very good at her job because then she looked at the history of my cards and was like, “I see you already had this card, why do you want it?” I told her it was a mistake that I changed the original Dividend card and that is why I wanted it again. The real reason why I wanted her to give me the list of eligible cards is because I wanted to know if there were unpublished cards that are still available. A few weeks ago, Citi mailed a pamphlet about all their Thank You points earning credit cards and these 2 cards caught my eye. The Citi PremierPass/Expedia card for the Flight Points. That program ended about a year or two ago for the “regular” cards and would be interesting to see if it can be revived via a product change. 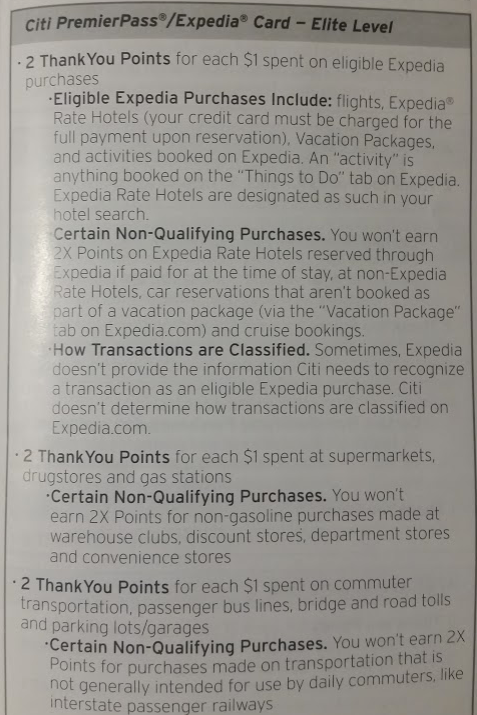 Really though, I was more interested in the PremierPass/Expedia card for the Elite level where you can earn 2x Thank You points at supermarkets, drugstores, and gas stations. I had mentioned the other day that I will not be posting about my credit cards, in order to convey this story clearly, I had to explain the card that I switched into. I am hoping that I can convert the card at a later time during the year into what I really want, but we will see. If not, then I will be able to maximize $600 this calendar year from the Dividend. $300 in drugstores and then $300 in Q4. Isn’t there a max payout of $300/yr for the dividend card (spanning all 4 quarters)? The title says product change in 11 months, but I don’t see anywhere in your story how you were successful doing that. Were you? Yes, I was successful in converting the AA card to Dividend. Looking at that same (presumably) brochure on Thank You point earning cards. 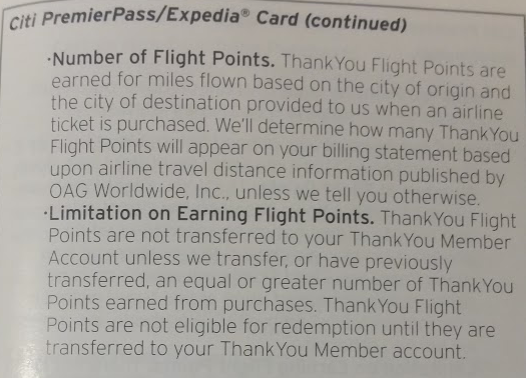 Both PremierPass cards say, “If your Card Account was opened before May 15, 2013, you’ll also receive 1 ThankYou Flight Point per 3 miles flown.” Sounds dead. Am I missing something? Did you get refunded the annual feed after the PC?